Noble’s stand-up routine is best known for its improvised and surreal performance, and its stream of consciousness delivery. He often mimes actions to help the audience visualise his ideas, and much of his act is often based around heckles or chats with audience members. From firing Elton John out of a cannon to urging the audience never to put a blanket over an owl, to portraying an epileptic flamenco dancer, his comedy tends to be very physical, and his stage sets extravagantly decorated. 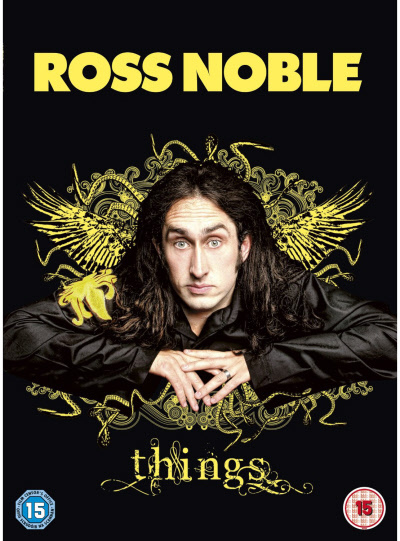 One of his most popular DVDs is called ‘Things’ and is available now. His latest release is called Nonsensory Overload. It is a dark night in the forest! Out of the moonlight swoops a tiny bird and it begins pecking at my ear, pecking and pecking! Deeper and deeper! Help me! Help! I’ve got sparrows in my mind! Tonight’s show is sponsored by Ted Danson’s Pizza shack! It’s Christopher Reeve the Musical! (On his hometown in Northumberland.) The ultimate in dullness. (On the Queen’s Jubilee celebrations in London.) They could have just had a massive pile of burning tyres and more people would have turned up. Especially if they put S Club 7 on the top of it. I had to take the batteries out of the carbon monoxide detector; it was beeping all night. Noble travels the UK and Ireland this autumn with his Nonsensory Overload tour. DVDs including Sonic Waffle, Randomist, Fizzy Logic and Unrealtime are out now.